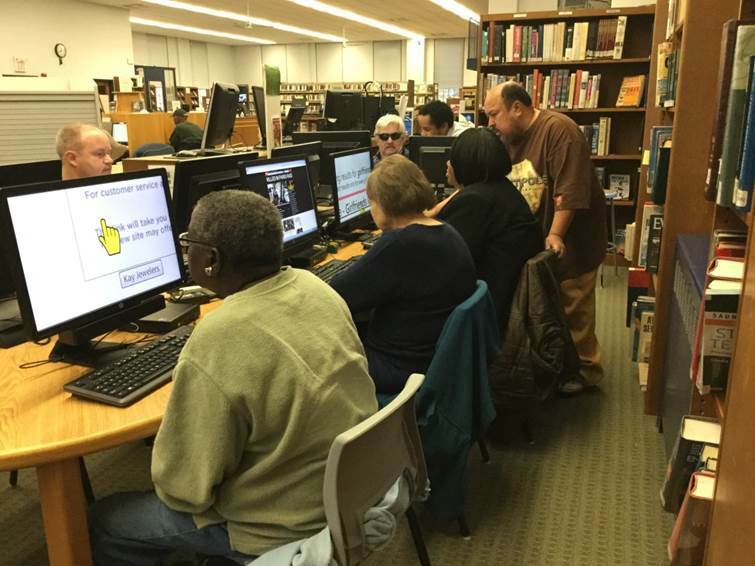 In New Jersey, public libraries are the heart of our communities and play an important role in reaching out to those with print impairments. The New Jersey State Library Talking Book & Braille Center (TBBC) is providing national leadership by working with New Jersey public libraries on several innovative projects to enhance access to assistive technology. Do you have questions about these projects? Call Mary Kearns-Kaplan at 800-792-8322, extension 834. TBBC is partnering with the New Jersey Commission for the Blind and Visually Impaired (CBVI) on the LEAP program. The Library Equal Access Program (LEAP) provides free computer and iPad training classes at assistive technology learning centers located in eight public libraries across the state. Training includes beginner and advanced level instruction on how to use reading magnification and speech software to read websites, emails and other documents, as well as an introduction to using the assistive technology features now available on iPads. This program is sponsored by the New Jersey Commission for the Blind and Visually Impaired (CBVI), and targets adults 55 years of age and older. Instruction for this program will be provided by Advancing Opportunities, and will include a lot of one-on-one assistance from Lolly Cheatham, assistive technology specialist, who has been instructing for three years. With patience as one of her prime virtues, Cheatham said the biggest challenge for her students with visual impairments is their level of knowledge of the technology and the terminology. CBVI is placing assistive technology computers and iPads in libraries. The computers offer assistive software programs for magnification & speech including: JAWS, Magic, Talking Typer and ZoomText. The iPads have built-in accessibility features for vision problems that include VoiceOver (text-to-speech) and Zoom magnification. 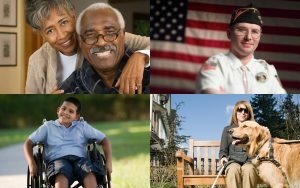 In 2016, TBBC received a grant from Disability Rights New Jersey to teach veterans to use the assistive technology features on iPads. Built into Apple’s iOS operating system for mobile devices are little-known accessibility features for those with hearing, physical, learning and vision impairments. The spirit behind pursuing this grant was to help reduce the digital divide for veterans by introducing them to new technology to assist them in their daily living. TBBC partnered with Advancing Opportunities on this grant. TBBC arranged classes to teach two groups of veterans how to use the assistive technology features on iPads, to help reduce the digital divide for veterans with visual impairments or blindness by introducing them to new technologies that can assist them in their daily living. One group had varying degrees of visual impairment; the other group of veterans were totally blind. The training included finger navigation, magnification and text-to-speech (VoiceOver) features, as well as an introduction to using assistive apps. The Braille and Audio Reading Download site (BARD), provided by the National Library Service for the Blind and Physically Impaired, offers downloadable audiobooks, audio magazines and Braille. Since many TBBC members either do not have computers or find BARD downloading difficult, we are partnering with public libraries around the state to have libraries act as BARD downloading centers for our members. 20% of New Jersey libraries are BARD Pilot libraries. Click here for a full listing. Books can be downloaded to a flash drive and played on the NLS digital talking book machine. This provides TBBC members, dependent on our books-by-mail service, access to many more books not available by mail.